Soak the noodles in hot water for 5 minutes. Drain and leave to dry 10 minutes on a clean tea towel in a tray. Add the ginger and spring onion and stir-fry for 1 minute. Lastly, thicken the sauce with the corn flour paste. Once the sauce is has a dripping consistency and wraps around the lobster shell, it is ready to serve. You will complete this step once you have added your sauce to your lobster stir-fry, so as to time both components for a successful finish of the dish. Heat 1⁄2 tablespoon vegetable oil in a large frying pan on high heat. Add in a couple of slices of ginger. 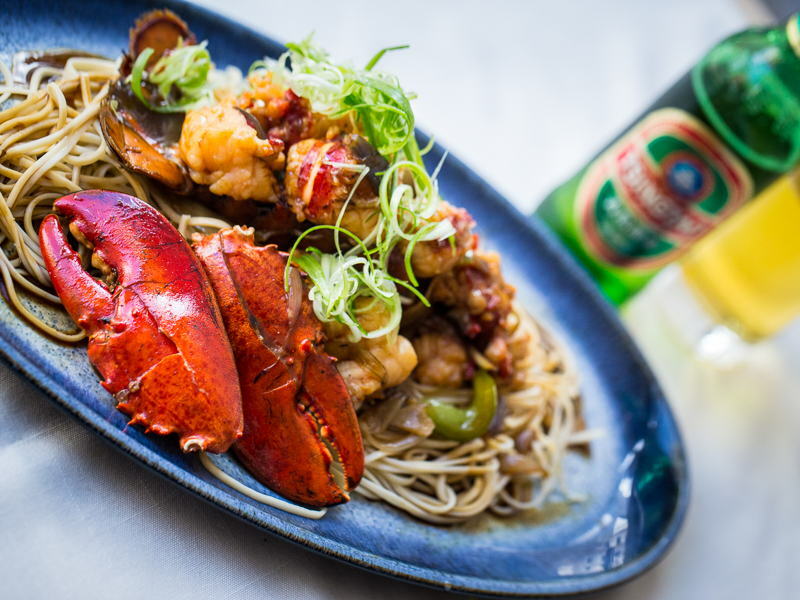 Place noodles on a large plate with lobster on top. Pour over the sauce and garnish with coriander.